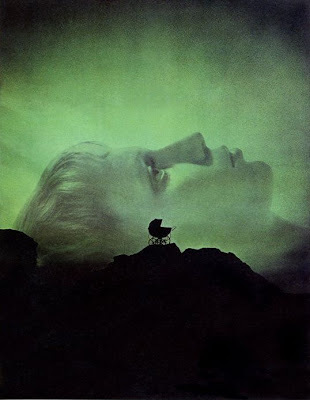 A landmark film of the horror genre, Rosemary's Baby (1968) also marked Roman Polanski's directorial debut in the US. The film, a runaway hit on release, was the prototype that inspired the onslaught of big-budget "A" horror films that followed: The Exorcist, The Omen, etc. In the tradition of Hitchcock, Polanski achieves his effects with little explicit violence but with maximum finesse. Like Hitchcock, Polanski assiduously maneuvers the emotions of his audience. Drawn into Rosemary's point of view and her growing alarm, the viewer becomes ever more aware that something is amiss but, like Rosemary, doesn't grasp exactly what has happened until the final scenes. This suspense is propelled by a careful ambiguity that implies Rosemary's terror may have a rational explanation (women do have difficult pregnancies), that her fears may be her own paranoia (though related to an infamous Satanist, her neighbors could just be a pair of elderly oddballs). On the other hand, the movement of plot and action make it difficult for the viewer to simply write off Rosemary's anguish. Equally ambiguous throughout much of the film are the majority of the characters. While Rosemary remains constant as the innocent young wife, those around her are more enigmatic - from her ambitious actor husband and her intrusive neighbors to her wise and kindly old doctor. Ironically, several of the most villainous characters are also the most comically eccentric. Another of the film's delights is its painstaking recreation of the specific time in which it was set, late 1965 to mid-1966. Costume designer Anthea Sylbert captured that timeframe's contemporary look with Rosemary's short shift dresses (some with peter pan collars), a long and luxurious plaid skirt, red chiffon lounging pajamas. Rosemary has her blunt-cut pageboy snipped short by Vidal Sassoon, she relaxes at home reading Sammy Davis, Jr.'s book Yes, I Can, the Pope's visit to New York is glimpsed on TV, and Time Magazine's famous "Is God Dead?" cover is shown on a waiting room table. The hand-picked supporting cast includes especially solid performances by Patsy Kelly and Ralph Bellamy. Uncredited but in an acknowledged key role is The Dakota, a famed gothic confection at 72nd and Central Park West. The Dakota starred as the Bramford, and exteriors were shot there. Because filming was not allowed inside, its interiors were recreated at Paramount. Significantly, the film begins and ends with aerial views of the building. Eve, I was 15 when Rosemary's Baby came out, and was not allowed to see it. I could understand why my folks felt that way after I grew up and finally saw the movie. They saw it and liked it, and were right that it is for someone more mature than a 15-year old! You have a good point about the styles and events of the time being depicted so well. I remember all the type of clothes Rosemary wore, the God is Dead magazine cover and the Pope's visit. The novels' author, Ira Levin, really knew how to write a good story. This was a movie that anyone who wants to be educated about or just enjoy horror films must see. As a matter of fact, I have it out on my coffee table with a few hundred other scary movies to watch through the Halloween weekend.! Becky - I first saw ROSEMARY'S BABY when it was newly released - and saw it several times in quick succession. It captivated (and chilled) me - completely drew me in and swept me along from start to finish. I later read Ira Levin's book and remember that it read pretty much like a screenplay - with a few differences. I bow to Roman Polanski for creating an incredible tour de force...even tho Bob Evans seems to give great credit to himself for enticing Polanski to direct the film (kudos to him for that)...of course, RP went on to direct another masterpiece just a few years later - the brilliant CHINATOWN. And much later, THE PIANIST...and along the way, an underrated dark gem, THE TENANT. a seminal film that garnered POLANSKI his reputation..much copied and envied..like CHINATOWN..very few can create brooding terror like POLANSKI!!! It is so disturbing because it taps into our human nature so deeply. At what cost would anyone of us want to achieve fame or greatness? As you point out Dawn, it was a perfectly cast film. The supporting cast was crucial because we need to be shockd that these eccentrics are a coven. I think, as you pointed out, an important element that Polanski adds to the mix is his sense of humor - though, twisted it may be. This is true for just about all of his dark voyages into human nature. I've met almost no one who has seen "The Tenant" and its probably his scariest work, from a psychological point (along with "Repulsion"), but even that film has some genuine black laughs. Polanski is a real artist not just some Hollywood hack. Its interesting to trace his influence on other filmmakers. Polanski is, in my opinion, one of the great directors. He is an artist who as I've mentioned before, like Hitchcock, is also a genius at manipulating the viewer's point of view and emotional response. No easy feat. The two also employ very dark humor in some of their best films. I haven't seen THE TENANT for quite a while, but it endures as one of Polanski's most memorable films (along with the others listed). Gypsy - good to hear from you (and I look forward to your soon-to-be-posted blog on art director Van Nest Polglase). I hope you will seek out ROSEMARY'S BABY, I think you'll understand why I singled it out this Halloween - and last Halloween - and any Halloween. Roman Polanski is a genius. 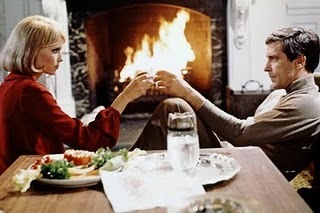 Eve, What a wonderful post on Rosemary's Baby. Which has two of the most memorable horror film performances ever. Mia Farrow, is perfectly cast as Rosemary Woodhouse, who really looks like she is suffering from her pregnancy. Ruth Gordon, is also amazing in her performace, of a woman with hidden motives. This is one of the few films that my husband can not watch alone. Eve, I really enjoyed reading your post. I always wondered how Polanski and Cassavetes got along. Actors who are also directors don't always take direction well from others. 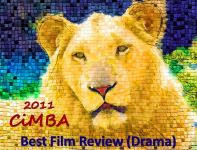 Dawn - I agree and think the cast is as solid as any aspect of this film. Every actor or actress with a speaking part is well-cast. Charles Grodin played Rosemary's first doctor - it was his first major film. Kim - I've read that Polanski and Cassavetes had difficulties (not only are they both directors - also actors - but their styles and approaches completely different). Cassavetes has been quoted that he thought Polanski was enormously talented but didn't like him personally.